A 3/4" bench surface with a 4.5" hole. 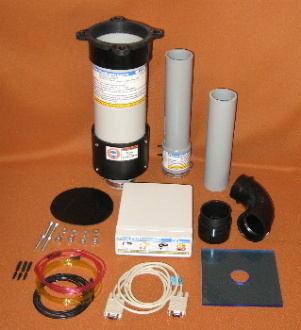 Add a high power air source and cabinet to your Basic 2.0 kit for a high power precision professional flow bench. 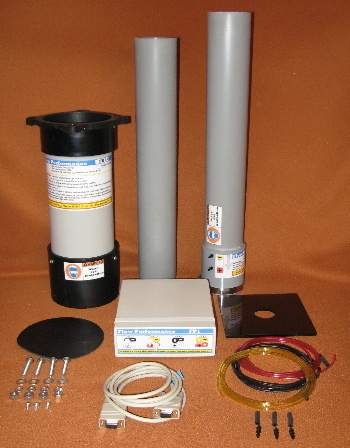 Or for more flow capacity, use our Flow Performance 2.5 Basic System kit like this one built by JDF Performance Inc.
"I found your system to be deadly repeatable, and simple to operate. 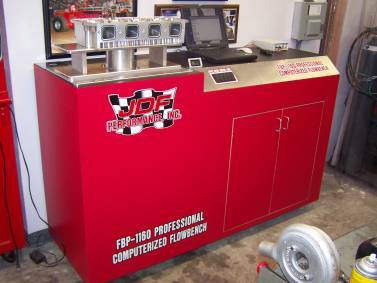 This is what flow testing should have always been.."
"We have a [major brand] 600 in our race shop but I prefer to use our FP Basic system"
The Flow Performance FP1 electronic flow rate processor can estimate flow rates from one test pressure to a predetermined test pressure in real time. 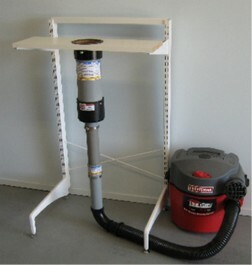 This allows the use of air sources like a shop vac without air pressure control. This flow bench uses our FP1 electronic flow rate processor, FE2.5 flow element and FV3 PWM Valve for automatic test pressure control. Multiple vacuum motors provide the air flow volume and pressure required to perform precision flow testing at very high pressures. Some vacuum motors are fitted with check valves from irrigation/plumbing sources. 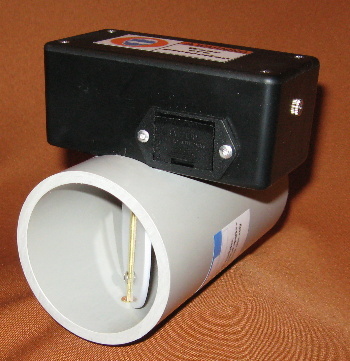 These prevent unused motors from becoming air leaks and spinning backward when not in use. 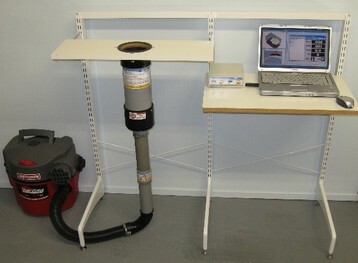 The included FPcom software for PC's gives you professional air flow analysis power. 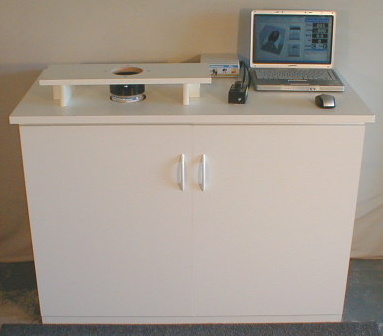 Place your Basic Electronic Flow Bench in a cabinet for a professional appearance. This work bench kit , from Do+Able Products, Model 12169, is available from Lowe's ($89.00) or Orchard Supply ($99.00) and can be modified for a flow bench cabinet. The cabinet is only 19" deep on the inside and will accommodate most 5 HP vacs, higher HP vacs may need portions of the back panel removed for clearance. Plenty of ventilation also needs to be provided. Add more processing power with Excel. Now our FPcom software allows you to capture velocity probe readings for building profile grids in Excel using your keyboard arrow keys! The Flow Performance FE2.5 flow element has become a popular choice for custom flow benches capable of flowing 600 cfm. You can add to your Elfa freestanding system. You can also get 96" tall standards (vertical pieces). The standards used here are 41" but stand 44" tall with the feet attached. KV brand shelf brackets will work on the Elfa standards, you want the 4 hook style brackets, not the 2 hook. Elfa freestanding shelf system works well for flow systems using the larger flow elements. SD, or styrene, drain pipe will just fit under the elfa feet if the pads are adjusted to full height. The Basic 2.0 flow bench kit is capable of testing internal combustion engine heads that produce up to 100 horse power per cylinder. Capable of withstanding test pressures exceeding 300"wc! 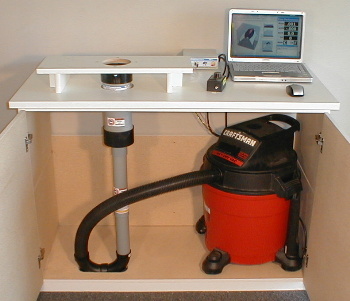 The Basic 2.0 kit powered by a shop vacuum is a great way to build a precision flow bench on a budget. Small, portable, low power consumption. 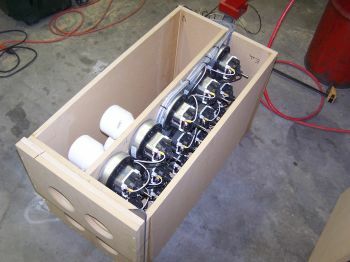 A perfect way to get started with a flow bench for effective, repeatable flow data. A perfect combination for the beginner or professional. 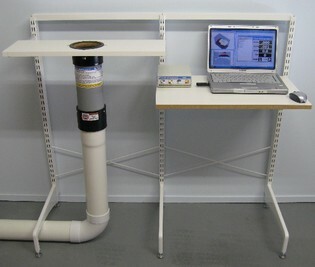 Add a high power air source and build a cabinet for a full power professional flow bench. While many FP Basic 2.0 customers are more than satisfied with their shop vacuum powered flow benches, the Basic 2.0 kit is also perfect for higher power flow bench duty.